Once upon a time there was a little leopard. She loved climbing trees, drinking milk, and singing. She decided one day to learn tap dance. Leopards maybe quick on their feet, but the little animal struggled to get into rhythm. A friendly tiger came along and showed her the importance of using her tail for balance. They practiced moving their long tails in unison until the dance evolved to the paws moving too. Soon both cats started to stand up and kick their legs just like show girls. But, they didn't notice until it was too late their big strong claws shredded up the room. Soon they were sewing up the sofa upholstery, and vacuuming the dirty rug. So much work caused just because the cats danced without regard. Like most kitties their claws got the best of them. Your little one is probably more graceful than the tap-dancing leopard. 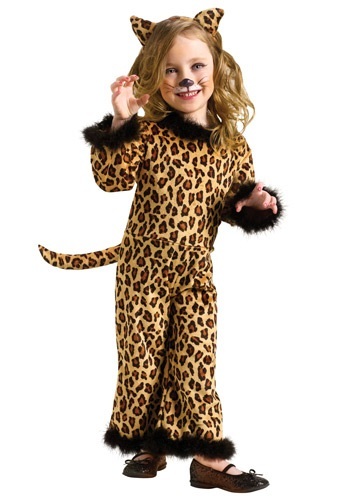 And they can be the cutest cat ever in the Toddler Pretty Leopard Costume. This 100 percent polyester jump suite is sure to make you child into a pretty feline. Black fur adorns the collar, ends of the sleeves, and pant legs. The tail has a Velcro attachment to it will stay put no matter how wild your kitty gets. To polish the look the costume includes a headband with cat ears on it. Let your little one bring out their inner feline, and have a meowing good time.